Due to safety requirements, strictly limited numbers can be accommodated at some of the sites and events in this programme. It is essential that you book a place for all events. Approximately ten days before an event those who have booked will receive details of meeting point, times, what to bring and appropriate clothing/footwear for the particular field trip. Leaders reserve the right not to accept members who have not booked, or who arrive inappropriately dressed especially footwear. 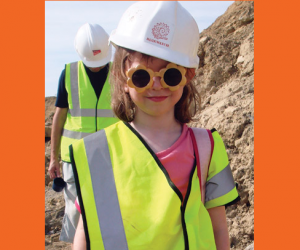 Stout shoes/boots must be used for all quarry visits – see our Rockwatch Geological Fieldwork code. All children must be accompanied by an adult. These are family events for children and young people. Wear sensible clothing for outdoor events suitable for all weathers – a lightweight showerproof jacket, fast-drying trousers, long sleeves. Wear sensible footwear such as trainers or walking shoes which have good grips.